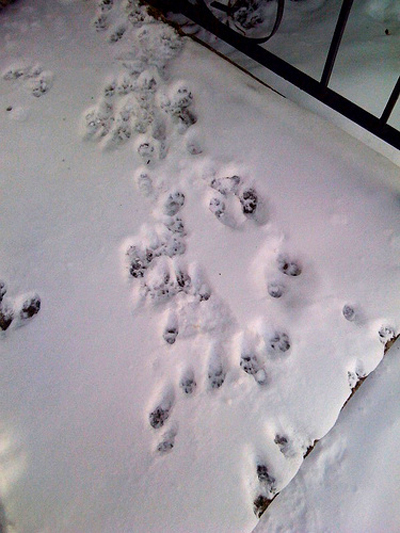 The snow has revealed a scurry of squirrels living under our porch. Look at their wee little footy prints. Next thing they will be breaking into the house and stealing our TV. NOTE: I was informed by Annegret that the proper word for a herd of squirrels is SCURRY. How perfect is that? Thanks Annegret! I think you may have raccoons rather than squirrels. Usually squirrels nest in trees and those prints look suspiciously like raccoons. Have you seen them? No we have never seen a raccoon, but there we do see the squirrels sprinting away when we pull in the driveway. 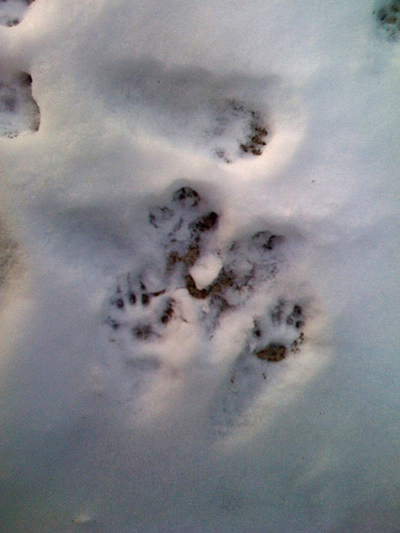 They look like raccoon prints to me too. You'll rarely see raccoons, maybe at night or twilight. This morning I saw one on my back fence at 5:00am. You actually don't want to see them, they only come out in the day if they're sick. They get into our garbage at night too. And we're in suburbia about 20 miles from NYC, not the country. Sorry, I realized my comment may have sounded a little snotty and I didn't mean it that way at all! I just wanted you to be careful because if it turns out they are racoons, it can be a real problem.